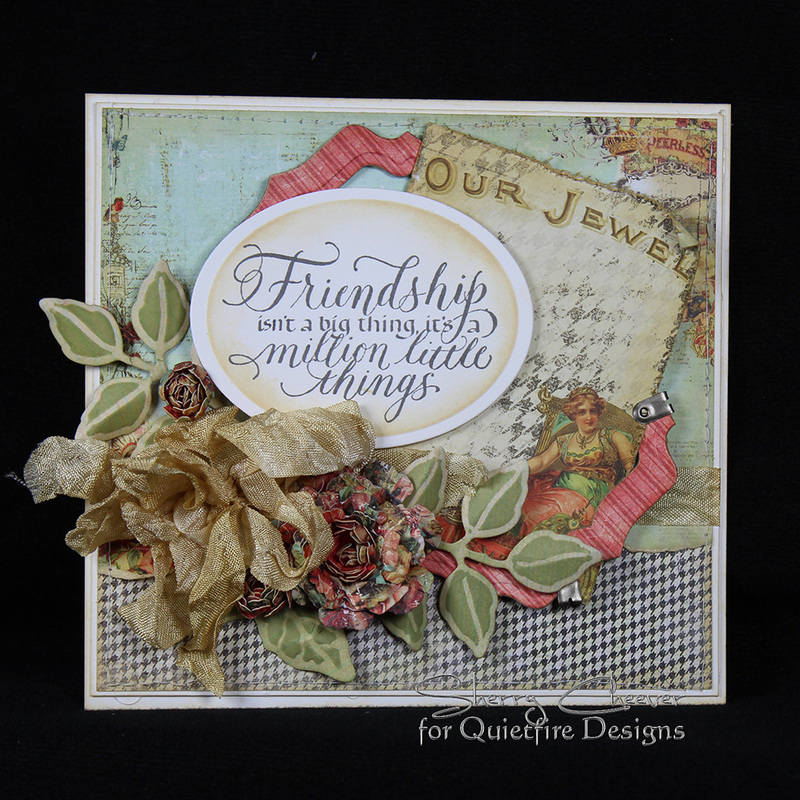 Hello Crafty Peeps, Terre here with a decorative card using Quietfire Designs Hope is the Thing With Feathers stamp. 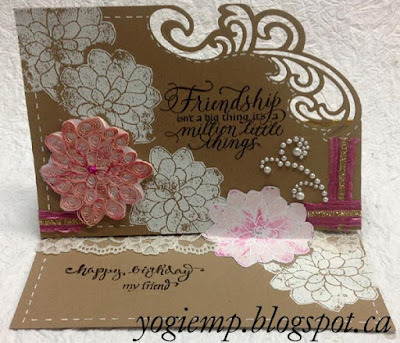 For this card, I used Spellbinders Die Templates and die cut the die directly into the card front, placed a piece pattern paper to create a back ground. I used Imagine Crafts/Tsukineko ink and stamped the Quietfire Designs Hope is the Thing With Feathers in the center of the oval. Hello and a good Monday to you!!!! It's Wanda here today and I'm sharing a Hug Book Page. When I first heard of Hug Books, I thought how wonderful it would be to make one for a friend, especially if they were going through a difficult time. It could be filled with beautiful artwork combined with quotes/sentiments about being friends and also uplifting, encouraging ones that could brighten and help them through the day. You could also include a few pictures of your friend and you. With that thought in mind I've completed my first page for a book. The page itself is white cardstock and I scored it along the left edge, first so I wouldn't forget to allow room for the page to be inserted in the book and second it helps the page to turn. The artwork is done on a piece of lightweight watercolor paper and attached to the page with double sided tape. I sprayed Distress Spray Stains in picked raspberry, peacock feather and just a little pumice stone onto a craft sheet, sprayed water over the colors and dragged my watercolor paper through the puddle, dried it, tapped it back into the left over color on the craft sheet and dried it again blotting a little with a cloth as it dried. 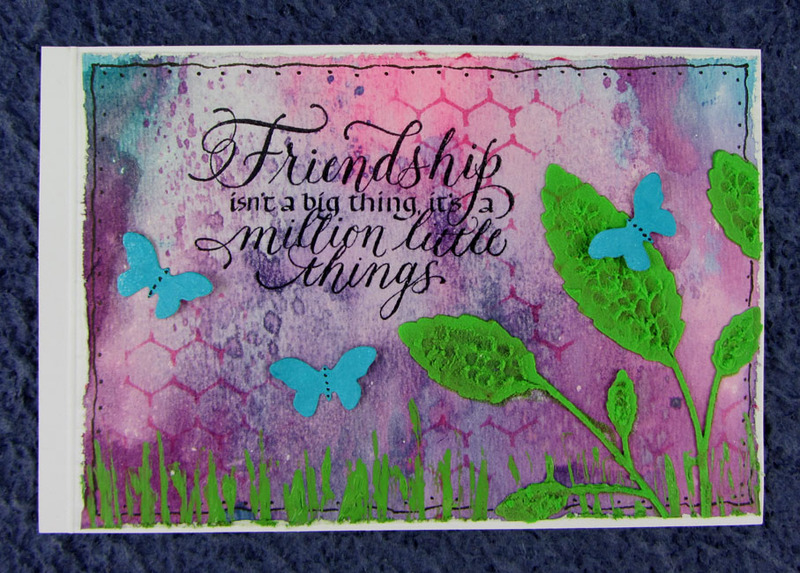 I stamped the quote with Archival Ink jet black and embossed it with clear embossing powder. My background was a little dark so I sprayed water over the quote area and blotted it with a paper towel to lighten it some allowing the quote to be seen better. The leaves are stenciled on with tinted embossing paste. I added the texture to the leave by tapping it with the tip of the palette knife. 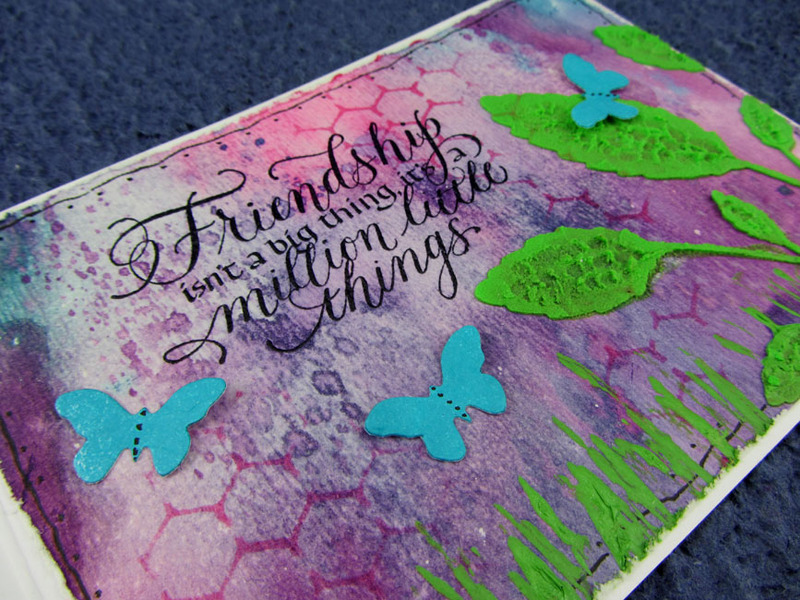 For more interest in the background I stenciled in a few places using picked raspberry ink. The edges are distressed and then I doodled with a Pitt pen. An old card and green paint were used to create the "grass" along the bottom. I colored a scrap of cardstock with peacock feathers spray stain, die cut the 3 butterflies, glued them on and added black dots using the Pitt pen. i thought i would share a fun idea for a Thank you card with a little bit of an asian flair. the sentiment with. It was super easy and lots of fun to do. Hello friends! 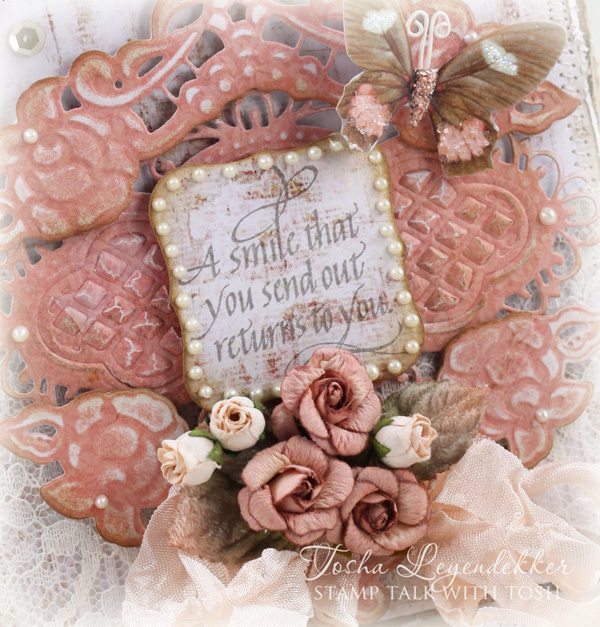 Tosha Leyendekker here today as guest designer with a Shabby card to share. I chose to feature the Quietfire sentiment “A smile that you send out returns to you.” I find that sentiment so true time and time again. And isn’t it so beautifully written? 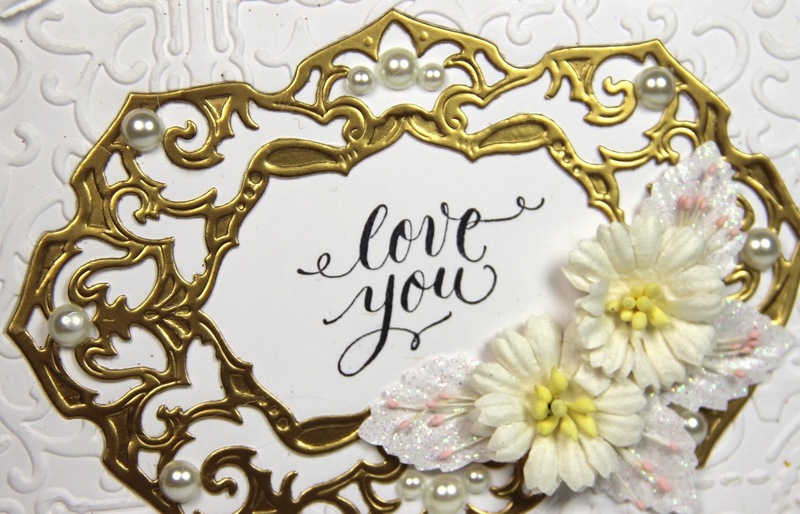 One of the most fun parts of working with Quietfire’s beautifully handwritten sentiments is finding the perfect dies, papers, and embellishments to compliment them. I chose Prima’s Debutante decorative paper along with Marianne Design dies, some vintage flowers, and a few other fun little extras. I diecut the frames, embossed them and then sanded them a bit to give a distressed look. I also sewed some random zig-zagging around the border to add to the distressed feel. 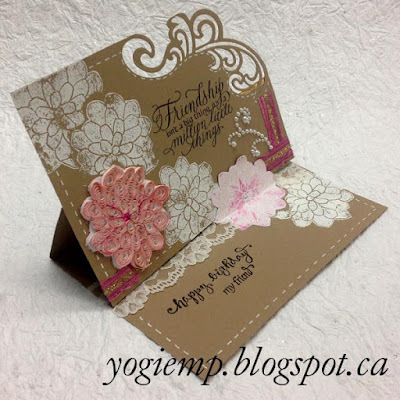 And what’s a “shabby” card without some lace? That’s it for my project. 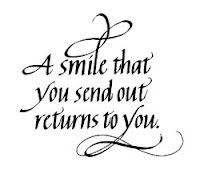 I hope I’ve inspired you to share some smiles today. Please visit Tosha's blog at Stamp Talk with Tosh! 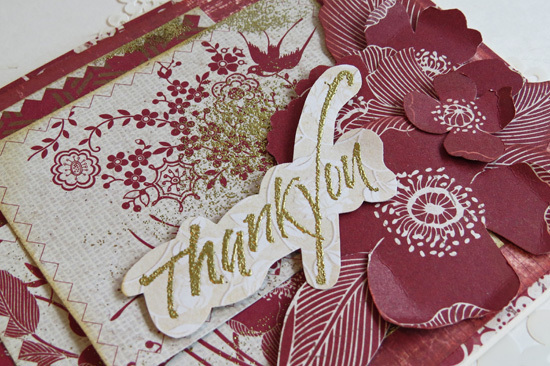 Thank you so much for sharing your beautiful projects with us Tosh! To read what a hug book is, simply click here..... it's all about hugging! This page is really simple to make. 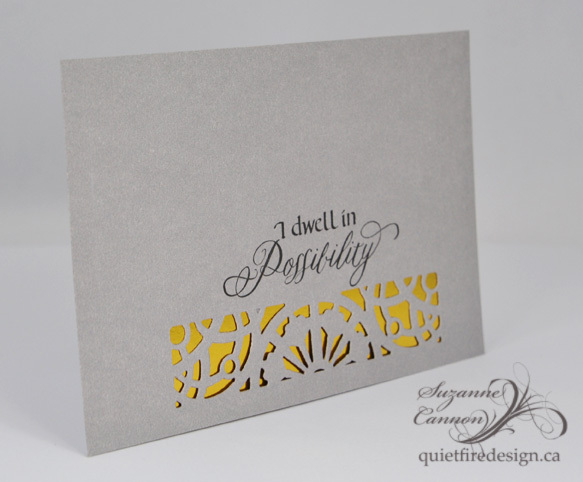 Just some embossing,die-cutting and...of course a gorgeous Quietfire Design stamp! Cut a piece of cardstock to size 4"x6". 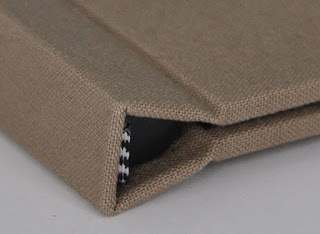 at 1/4" on the left side of 4" side, score a line (this is the folding line where the hug book pages are fastenend). Trim a piece of white cardstock to size 3 5/8" x 5 7/8". Die-cut the label from the centre. alter the page by using a distress toll and then slightly ink the edges of the torn paper. 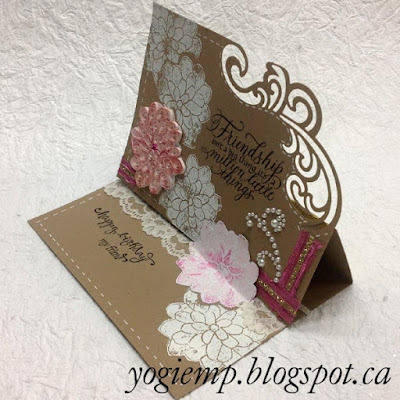 Glue the embossed paper onto the page. 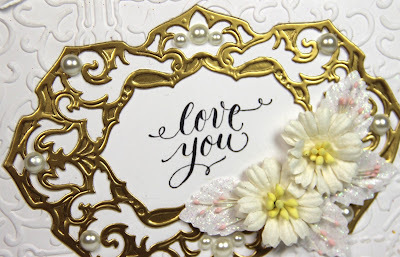 Die-cut the label from gold cardstock and glue into the embossed frame. stamp the Quietfire Design sentiment into the frame. embellish with (thin) flowers, leaves, stamens and self-adhesive Pearls. I hope you like my little page. Yogi here today with an easel card, hand carved stamp and quilling... and loving the newest stamps from Suzanne - I'm using "Friendship Isn't a Big Thing..."
I scored and folded my Kraft cardstock to create the easel (7"w 5"h card closed). The cardstock was cut to 7"w x 10"h and scored at 5" and 7.5". Cut another piece of Kraft cardstock for my front (7"w x 5"h). Created my peony stamp, drawing directly on the clear lino (Jack Richeson & Co) using a Staedtler Lumocolor black marker (a Bic marker or Sharpie work well also). Cut the design around the outside edges with an x-acto knife, then started carving the petal lines using a fine "V" shaped Speedball carving tool. 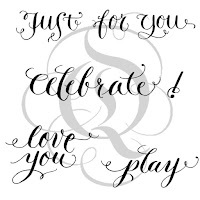 PS this is the easiest type of stamp to carve and considered a solid image stamp or watercolor stamp. Inked up the stamp using Versamark, stamped and embossed with white embossing powder. I cut the stamp image from some scrap copy paper as well to use as a mask, and then continued stamping and embossing with the white. PS there is a stamped image under the quilled piece. It was almost as I finished the card I decided to do some quilling on it... which I did with my eCut white quill strips I made a while back, coloring them with Distress "Spun Sugar" and adding a pink rhinestone center to the flower. When the quilled flower was finished and adhered to an under layer, I hit the tops with some "Picked Raspberry". 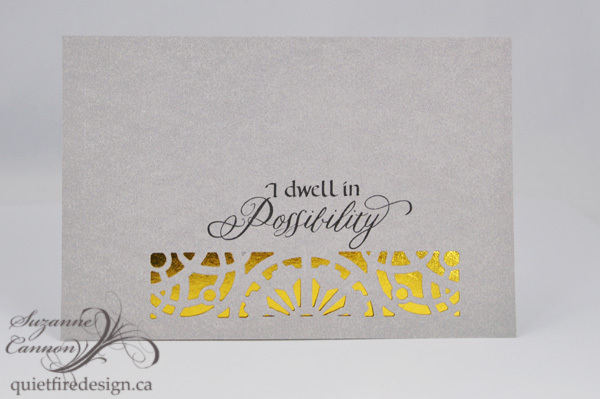 Die cut the diagonal edge using Creative Expressions (Sue Wilson "Gemini - Lyra" die set). Added Sari ribbon to the edges and then some faux stitching lines using a Sakura white gel pen. Final touch added some white pearl flourishes. Adhered to card front. I also adhered some gold patterned wrapping paper (Paper Roots) to the easel flap to peek through the die cut area when card was closed. On the floor: Stamped another of the peony and white embossed. Cut another peony, this time from white cardstock, inked my stamp with the Spun Sugar and a touch of the raspberry, misted with water and stamped, folded it in half and adhered part to the floor to act as a stopper. Adhered a piece of white lace, just peeking out from the easel front. 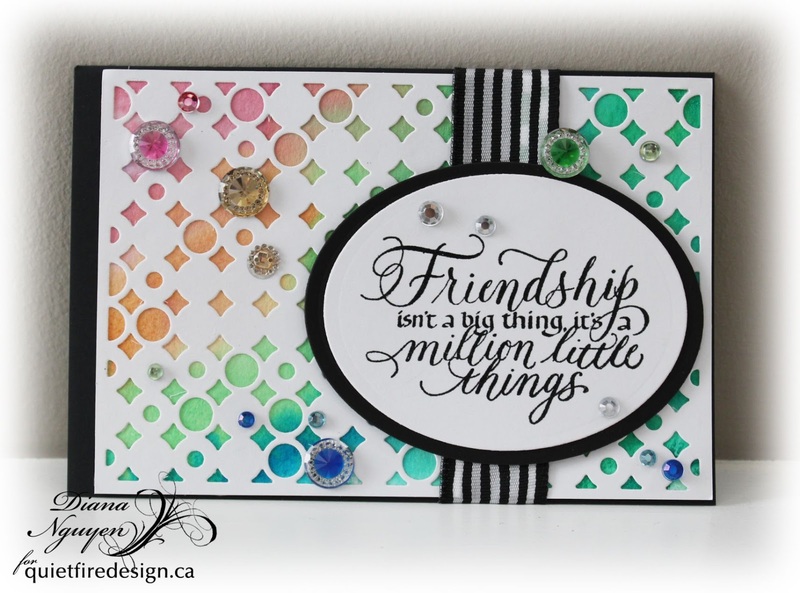 Stamped the birthday sentiment and the "my friend" using the black onyx and clear embossed. Continued with the faux stitch lines. 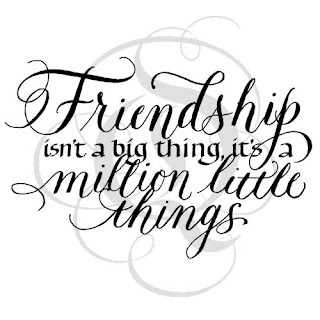 Friendship Isn't a Big Thing! Good morning! Sherry here with you today and I have a card to share using the new Quietfire Design mounted stamp, Friendship Isn’t a Big Thing. 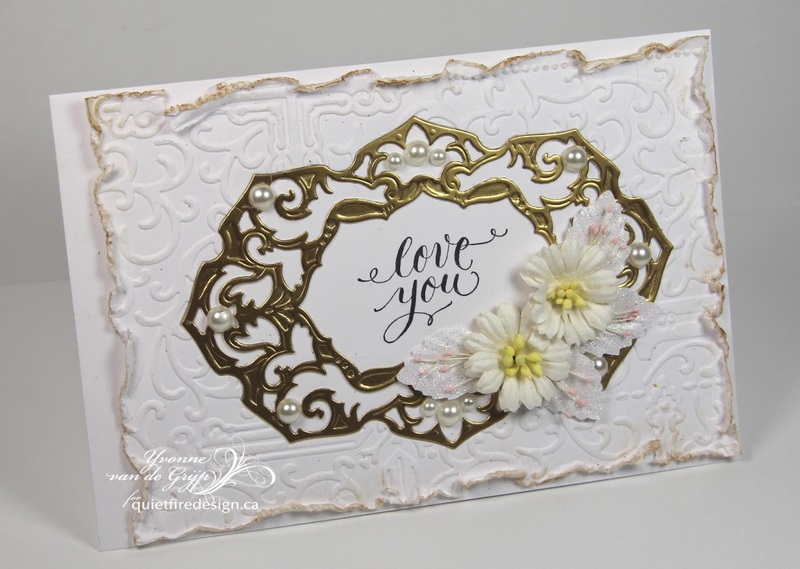 I used some Prima paper, Cigar Box Secrets, for all elements of the card, sewing the background to a base of white cardstock and building up from there. A frame was made by gluing a coordinating paper to chipboard and then die cutting with a set of labels. 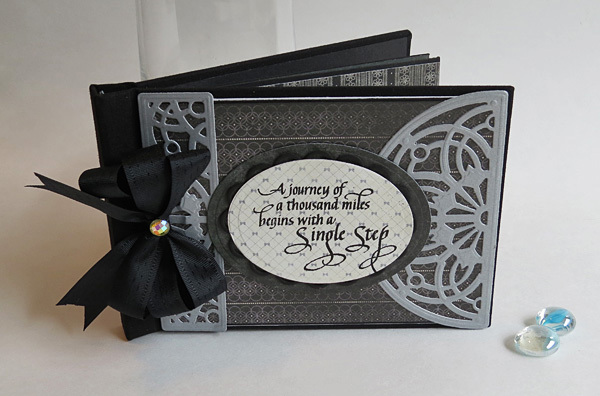 The sentiment was stamped in gray on white cover stock and then die cut with ovals. 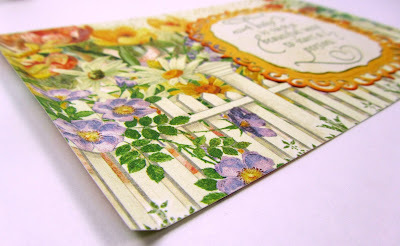 While the paper was still in the die, the edges were sponged with Antique Linen Distress Ink. I don’t know the color of the seam binding ribbon . . . it was in my stash jar, matched and I used it! That’s all I have today. 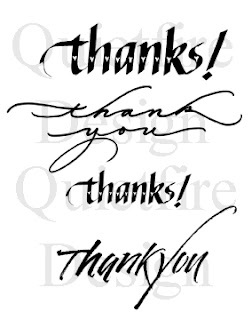 Thanks for stopping in and joining me! Hi there! It's Suzanne today here to share a Hug Book Page with you. What's a Hug Book? Click here to learn more! I decided to continue on with Teresa's theme of a graduation book. She did such a beautiful job on the book, it inspired me to work outside my usual colour range! I went with my theory that simplicity is elegant. 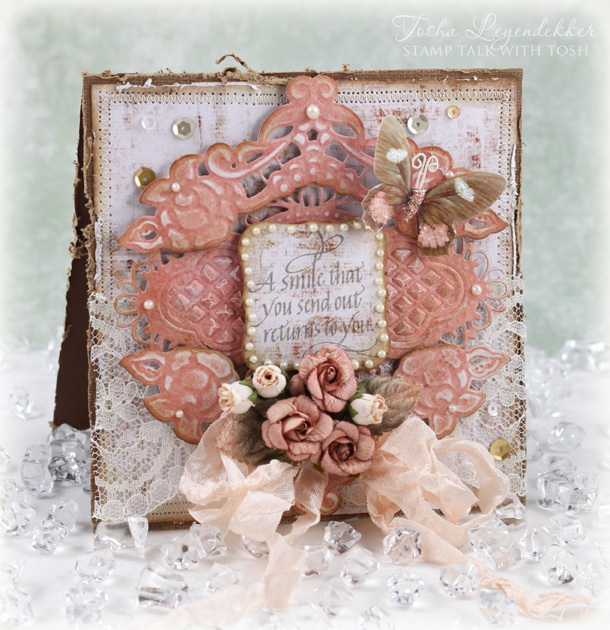 Not only did I continue with Teresa's colour palette (except I added gold), I used the same Becca Feeken design die set. By offsetting the design elements to the bottom, it will break any repetition in centered page design and wake the reader up! 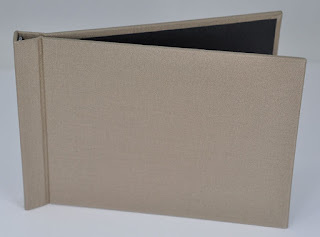 Die cut the cardstock by aligning the die 1/4" from the bottom and approximately 3/4" from the opening edge of the book. The center of the page will actually be shifted because part of the page is embedded in the binding. Use a stamp positioner to stamp the sentiment. Cut a piece of lightweight gold paper or foil to 4x6". You can adhere this to the back of the gray cardstock, or it can become a new blank page behind your gray page. It's that easy! 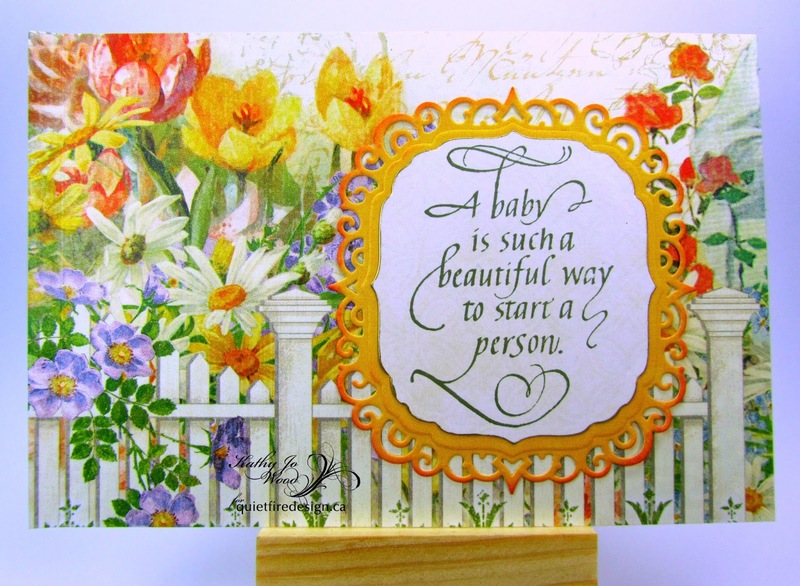 Hello Everyone, Terre here with a creative card using Quietfire Design wonderful sentiments. For this particular card, I used the Invisible Tears Stamp. 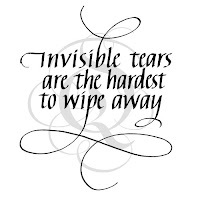 If you stopped and thought about what this sentiment says to you, it is so true, Sometimes the tears we don't see are the ones that matter the most. 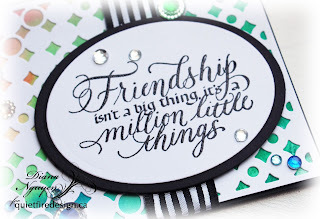 I used Spellbinders Stately Circles and Classic Circles Large, I then stamped my Invisible Tears sentiment on the circle using Imagine Crafts/Tsukineko Memento Tuxedo Black ink. Popped up the circle using Scrapbook Adhesives by 3L Foam Squares as well as Beacon Adhesives Zip Drive to place my pattern paper to my card front. Hello! Diana here sharing a page a made for a hug book. If you're curious as to what a hug book is, here is a link to the post. And here is the link to the hug book in the store. I love clean and simple cards so I thought it would be pretty easy to make a flat example... and it's pretty flat except for the jewel embellishments. I just could not resist using some new toys! 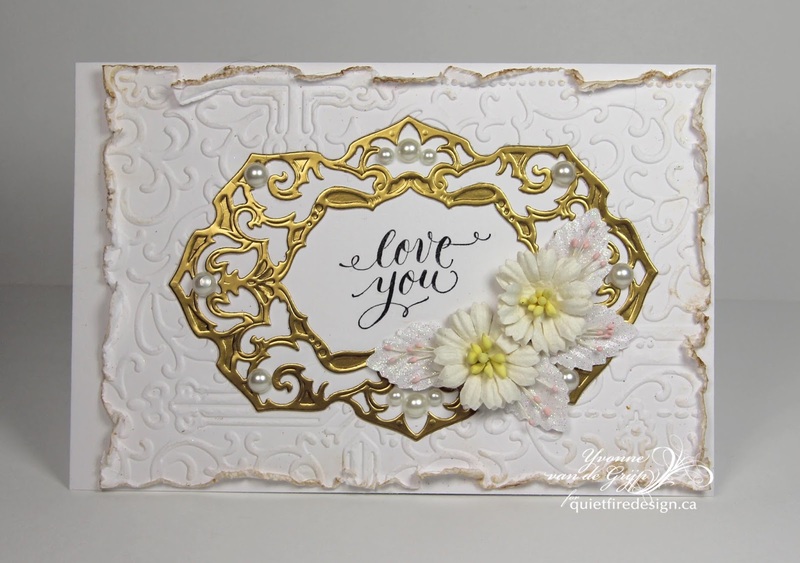 I had just picked up the Spellbinders Contemporary Circles die as well as some jeweled embellishments from the Scrapbook Convention last Saturday. Unfortunately, in my eager state, I went and organized all my embellishments and tossed the packaging so I have no idea who made them. :( But I knew they would go perfectly with the new stamp Friendship Isn't a Big Thing. 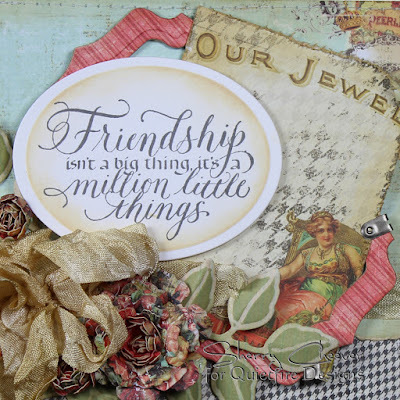 Friendship is worth more than any jewels and jewels are pretty precious even when though they come in little sizes. To make my hug book page, I started with a sheet of black card stock sized 4 x 6. The Contemporary Circle die is only 5 1/4 long but I got around that by cutting it and hiding the "missing" portion with a piece of wide, striped ribbon. There is a quarter inch spacing on the left of the page so that I could stick it in the hug book and not lose any portion of my card. The colorful background peaking out behind the die is a watercolor wash of some of my favorite shades. I added the rhinestones to match. 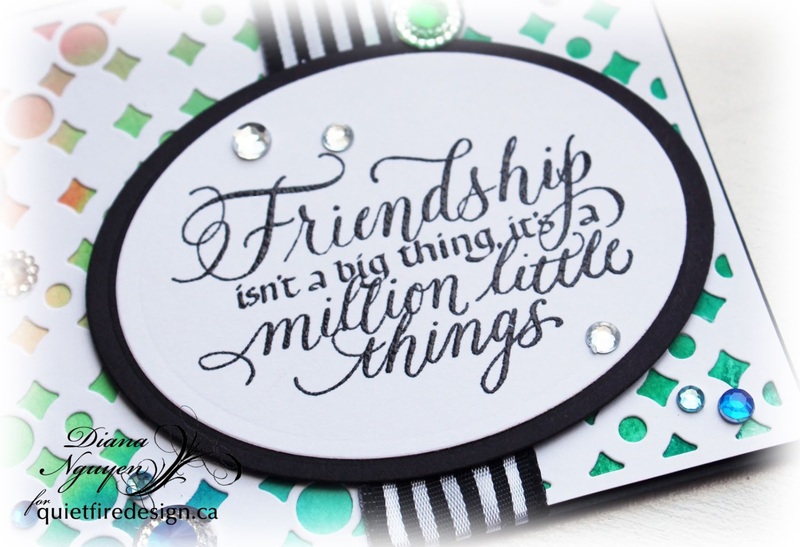 The friendship quote was stamped with Versafine black pigment ink and then clear embossed. I matted it with a slighter larger black oval to tie in the ribbon and black page. I hope you like it and try out making a hug book of your own! Hello All! 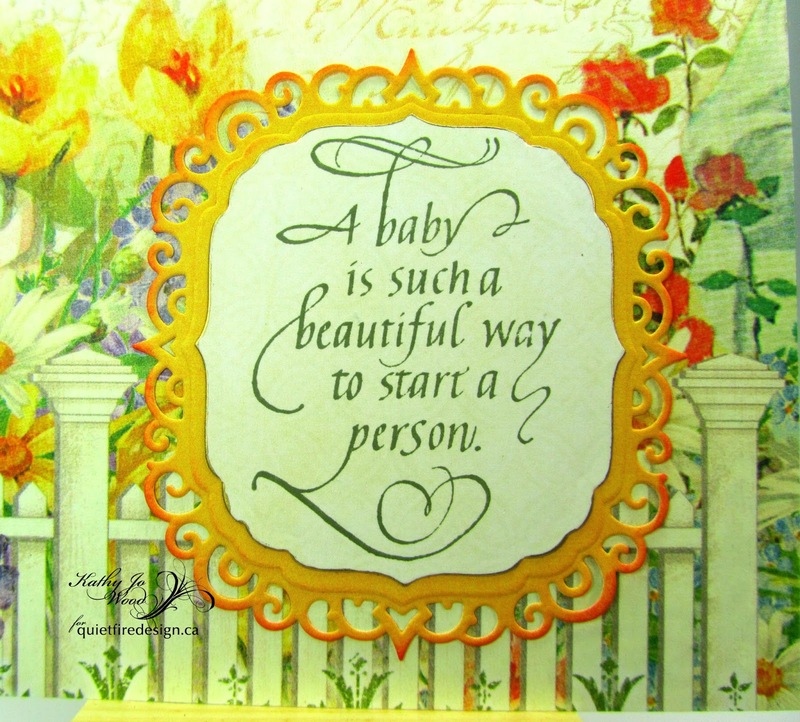 Kathy Jo here sharing a page for a baby Hug Book. If you missed last week's post regarding the hug book, here is a link. And here is the link to the hug book in the store. 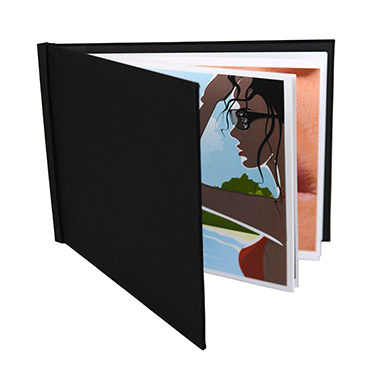 Hug Books are reusable, expandable and use no harmful glues to hold the pages together. Simply pull back the cover and the spring clamp opens up, insert the pages and it snaps back together. If you make a mistake or want to add a few extra pages, simply reopen the spring clamp and adjust as necessary. On the back side I added four die cut corners so that the gift receiver can add a favorite baby photo. Quick and easy first page to a book! 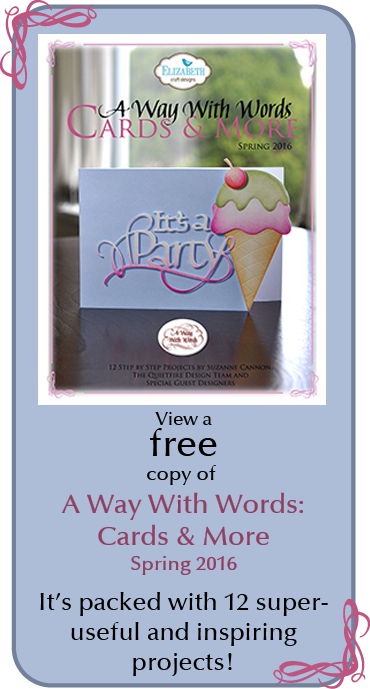 A gift book could be made in a reasonably short time with a pad of paper, some sentiments and photo corners. Gotta love it when a beautiful album or book can be made in reduced time! Hope you enjoyed the first page of my hug book! Will share more when I complete them! 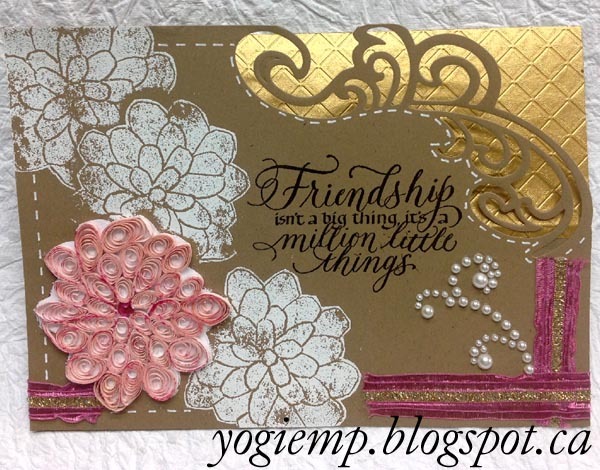 New Encouragement, Friendship & Snowflakes! But I'm so excited! We have new stamps! 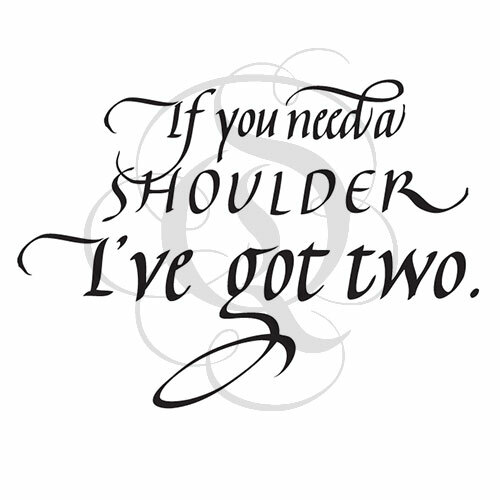 The first is the return of a wonderful phrase in a new format and is now on foam with cling. 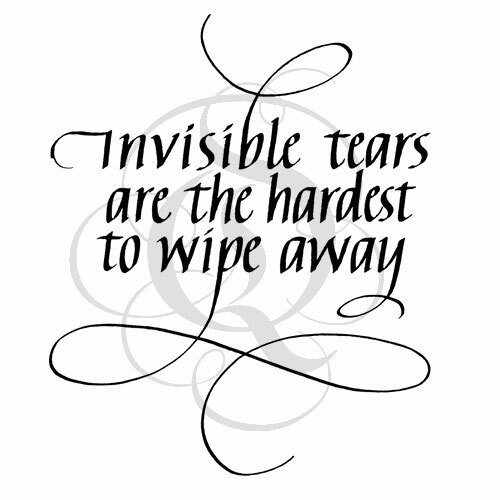 Invisible Tears is the perfect sentiment for someone who is experiencing a difficult time, suffers from a chronic illness or has experienced a loss. 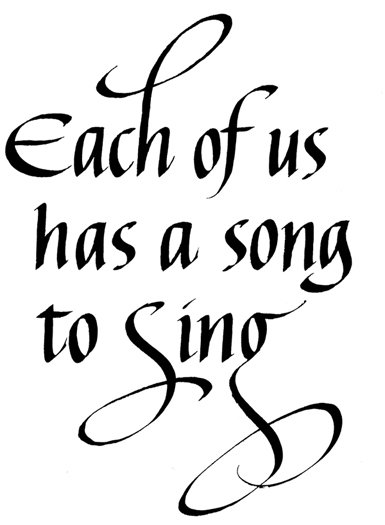 I have reworked the flourishes and they now seem like they are sweeping away those invisible tears. 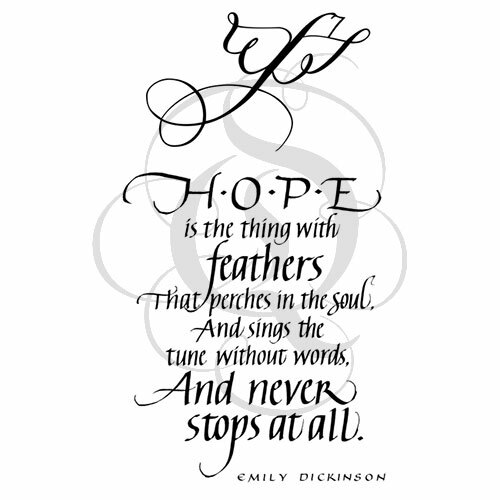 Hope is the Thing With Feathers is an example of the old made right! This originally came to me as misquote. 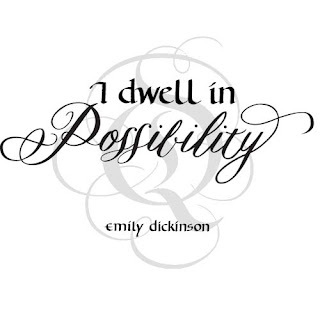 Sorry Emily (Dickinson, that is)! I think it's fixed now! 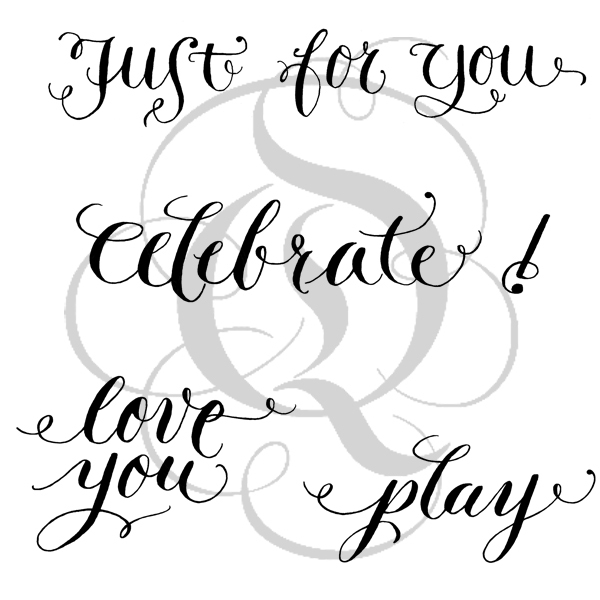 I've added a calligraphic ornamental birdie, too, so get out your feather dies and digital cutting files (there is a Quietfire Feather here) and begin your creating! 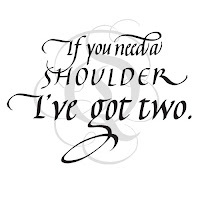 If You Need a Shoulder is now mounted with cling and is smaller in size. 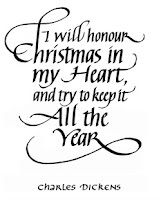 Both Each of Us Has A Song and I Will Honour Christmas now come mounted with foam and cling. So what do we have that's new NEW NEW? How about a beautiful friendship quote! 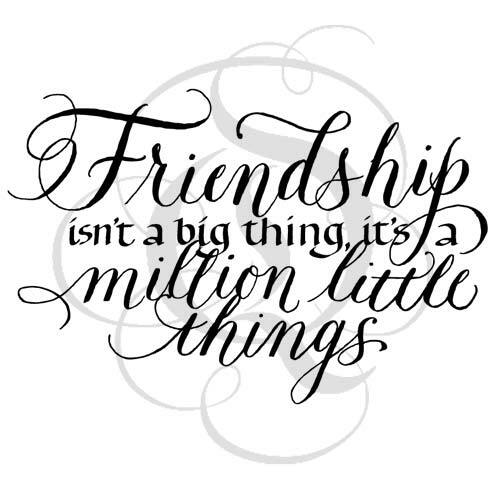 Friendship Isn't a Big Thing, it's a million little things. It's so true, it's the little things that count so much. 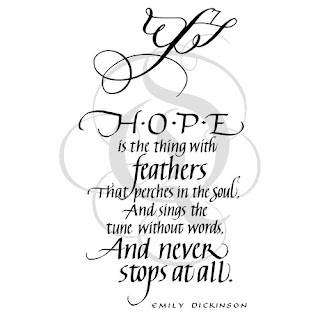 Emily Dickinson penned this quote. I think I have it right the first time! I Dwell in Possibility is such a wonderful quote for some who is making big changes in their life such as a graduation or a retirement. Anything is possible! 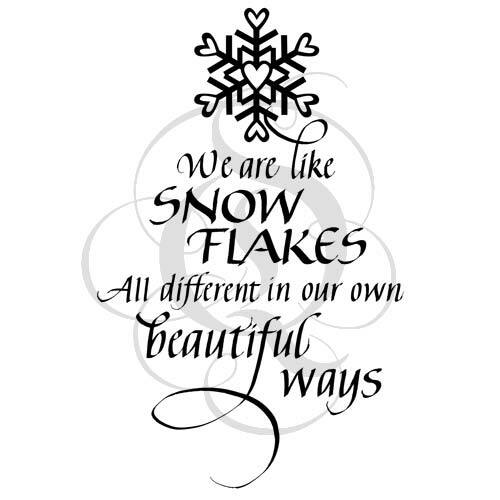 And what would a Quietfire year be like without a snowflake quote. 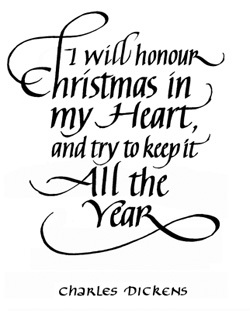 We're early with it this year (there is nothing like having to prepare an autumn magazine ad to get me motivated!). But it's almost summertime!, I hear you calling to me. I know! But I do sell Christmas designs all year round. Meet We are Like Snowflakes. You can see our complete snowflake collection here. Thanks for dropping by! We hope you like the fresh new stamps! It's Suzanne here, but really it's Teresa! I asked Teresa to decorate the front of a Hug Book - she chose the black cover, thinking it would work for a wedding, too. You've already seen this cover when we told you all about Hug Books in our last blog post but here are some details. Teresa plans to fill this book with inspirational saying for someone who is graduating. Isn't this absolutely beautiful?! 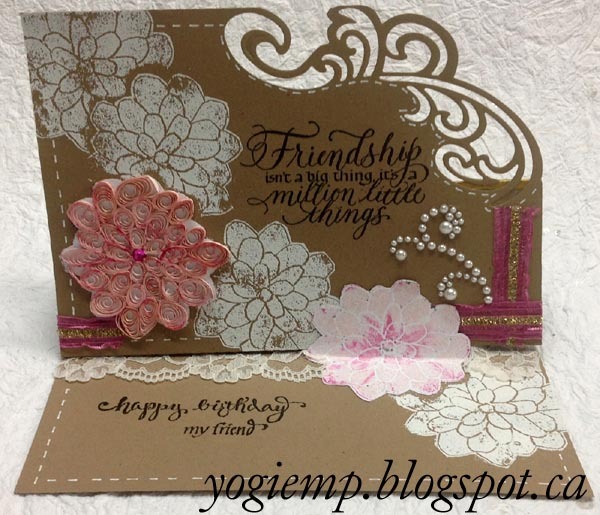 Watch this blog for Hug Book sample pages created by the Design Team over the next few weeks! Thanks for dropping in! Give Teresa a round of applause for this beauty! What is a Hug Book? It's a book you receive from someone that seems to give you a little hug every time you open it! Hug Book cover created by Teresa Horner. I saw these blank books at CHA and was immediately drawn to the potential in them! They're so easy to use! And what you put in them? The sky is the limit. And no bookbinding skills needed! Click here to see the Hug Book on the website! We have them in two colours, black and tan (sounds like a few dachshunds we've parented....) and the page size is 4x6" landscape. The cover is a wonderful smooth bookcloth. There is nothing cheap-plasticy looking about them! Not only can the pages contain "hugs", the book hugs the pages! To load the book, you merely fold the covers back (it works like a big paper clip, in a way), insert your collection of artwork and return the covers to their normal position. Here are some detail pictures. Just click on them to see larger photos of the Hug Book that's waiting for your love! 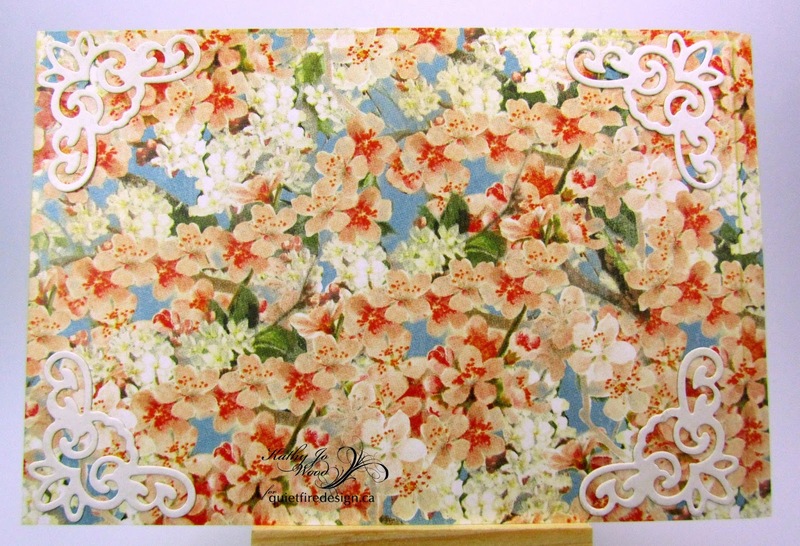 They're perfect for your coffee table or mantle - or fit in most purses! So if you decide to make a Grandma's Brag Book, you've got it right there to share with your friends. These books were really designed to hold photographs, but we see them holding pages filled with beautiful words of wisdom and encouragement. If you're a designer, you might use this as a mini portfolio. Use them as a wedding book, a baby book, an encouragement book, a cook book or as Teresa has used it - a graduation book. You could send someone a Hug Book with a decorated colver and then send them pages to insert in their Hug Book on special occasions. Over the next few weeks, the Quietfire Design Team will be creating sample pages to jump start your creativity as you make your own Hug Book. Here are some tips for making your Hug Book! Choose light weight cardstock. You want to be able to separate the pages! If you do use heavy cardstock, it will help if you score your page along the "fold". If you're able, make sure the grain of the paper runs parallel to the spine. That will help the pages bend over the previous page. Don't add to much dimension to your page. I adore a book that yawns at the fore edge, but if you want the recipient to take it with them, try not to add too many items to the pages that are thick. You especially don't want things to rip off the cover! Cut your pages 6" wide by 4" tall. Leave 1/4" undecorated along the left edge of the page because that will be where all the pages are hugged together. We hope you like our Hug Books!